These Caramel Stuffed Peanut Butter Blondies feature soft and chewy peanut butter blondies stuffed with a gooey and delicious caramel filling! Taste: Full of peanut butter and caramel flavor. Texture: The bars are soft, chewy, and full of gooey caramel. Ease: These are fairly easy to make and mix up! 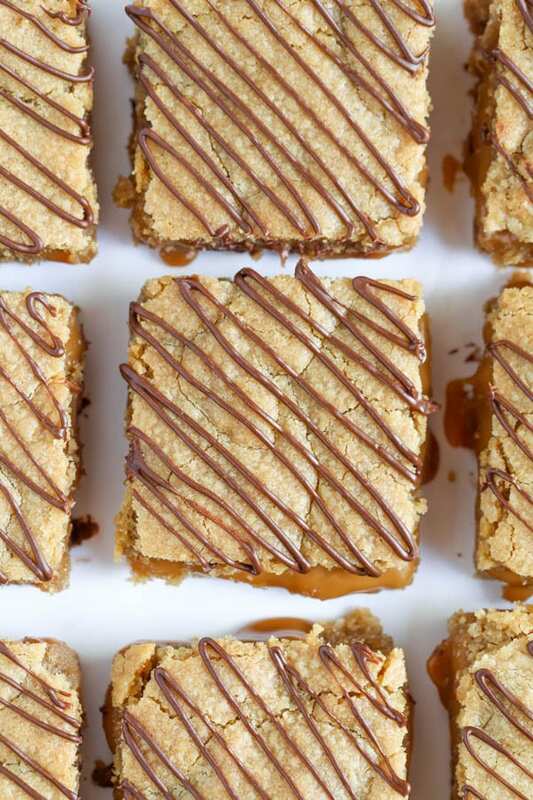 Appearance: The gooey caramel in these bars and the chocolate drizzle make them so gorgeous! Pros: These bars are easy to make and delicious. Cons: You do need to give the bars a couple hours to cool before slicing into them. Would I make this again? Most definitely! When it comes to desserts, I tend to always go for anything with peanut butter in it. There’s something so addicting about it, especially when it’s paired with chocolate and caramel. I love adding caramel into different desserts too because it takes almost any dessert from delicious to over-the-top incredible! After my first bite of these blondies, I knew that they were a winner. Between the soft peanut butter blondies and the gooey caramel in the middle, I found it really hard to stop at just one. 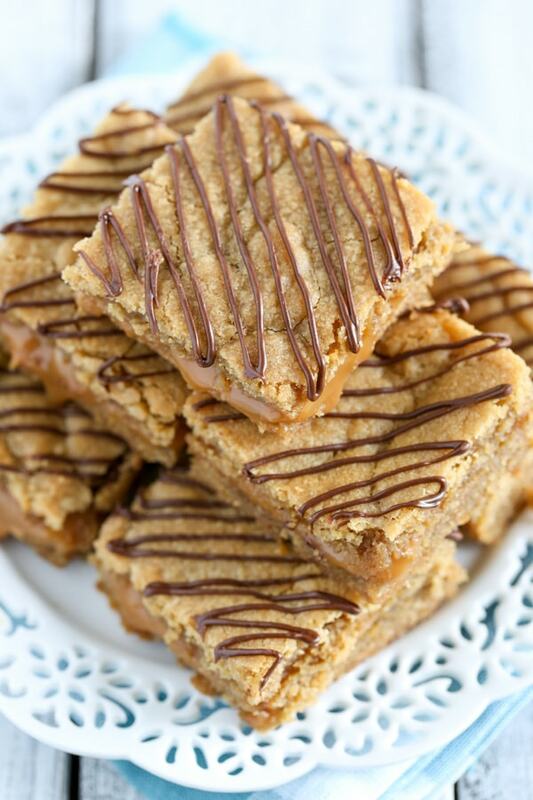 I almost think these blondies should come with a warning label – ADDICTING! I wanted to keep these bars a little on the easier side, so the ingredient list is fairly simple. You’ll start by mixing up the peanut butter blondies, which just uses one bowl and you don’t even need a mixer! I found that baking the bottom half of these blondies first helps to keep the caramel layer perfectly in the center once they’re done baking and you cut into them. So, you’ll scoop half of the batter into an 8-inch square baking pan and bake it until it’s set. Once the bottom half is baked, you’ll take it out of the oven and set it aside while you make the caramel filling. The caramel filling is also extremely easy. You’ll add some soft caramel candies and a little bit of heavy cream to a bowl and microwave it in 20-30 second increments until it’s nice and smooth. 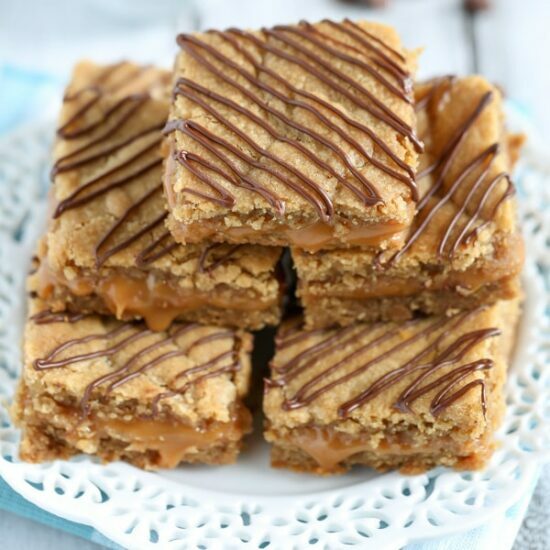 You’ll pour the caramel sauce over the half of the blondie mixture that you just baked, making sure to leave a little room at each edge uncovered. Then for the final step, you’ll put the rest of the peanut butter blondie mixture on top of the caramel. The easiest way that I found to do this was to press pieces between my hands and flatten them out a bit, then piece it together on top. As the blondies bake, the top will bake up beautifully into one piece. 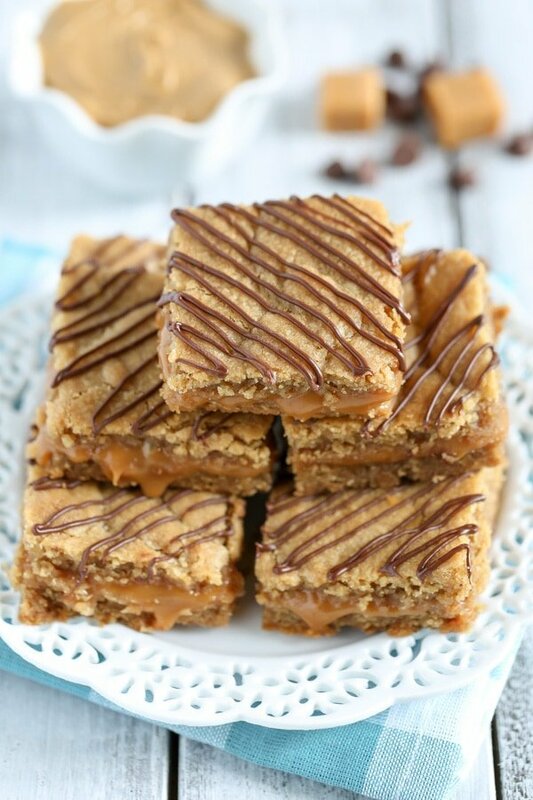 You will want to wait for these blondies to cool for at least 2 hours, that way they’re easier to cut into and the caramel has some time to firm up. The hardest part of making these blondies is waiting for them to cool. But they’re so worth it! Trust me. Preheat oven to 350°F. Line an 8-inch square baking pan with aluminum foil, making sure to leave some overhang for easy removal. Set aside. Add the melted butter, peanut butter, and brown sugar to a large mixing bowl and mix until well combined. Add in the egg and vanilla extract and mix together until fully combined. Then, mix in the flour, baking soda, and salt until just combined. Scoop half of the blondie mixture into the prepared baking pan (set the other half aside) and press it down into an even layer. Bake at 350°F for 12-13 minutes or until the top is set. Remove from the oven and set aside while you make the caramel filling. 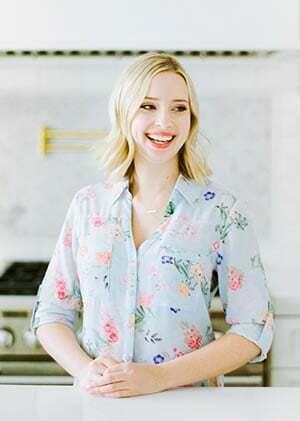 Add the unwrapped caramel candies and combine them with the heavy cream in a separate microwave safe bowl and microwave in 20-30 second increments, making sure to stir well after each increment, until the mixture is melted and smooth. Pour the caramel over the bottom half of the blondie mixture that you just baked, making sure to leave about 1/2″ of each side uncovered. Top the other half of the peanut butter blondie mixture on top of the caramel by taking pieces, flattening them a little with your hands, and gently laying it over the caramel. You want to make sure the pieces are overlapping and completely covering the caramel. Bake at 350°F for 15-20 minutes or until the top is set and lightly browned. Remove from the oven and cool on a wire rack for at least 2-3 hours before cutting into the bars. If adding the chocolate drizzle, add 1/4 cup semisweet chocolate chips to a microwave safe bowl and microwave in 20-30 second increments, stirring well after each increment, until the chocolate is melted and smooth. Drizzle the bars with the melted chocolate as desired. Prep time also includes cooling time. These sound so delicious. Thank you. That caramel oozing out of the center!! I can’t resist!